Artistic Outpost opened its doors in the fall of 2007. Robyn Sharp and Shelley Carr are both weekend crafters, wannabe entrepreneurs, and corporate managers, and to them Artistic Outpost allows them the opportunity to steer the direction of an enterprise that is truly their own. Robyn designs the stamps. Shelley keeps Robyn from designing crazy stuff, and Steven (Robyn's husband) manages the "home office". Hello everyone! You are not on the wrong page. I have a bit of news I'd like to share. The creative folks over at Artistic Outpost have asked me to be a guest designer for the next three months! I am super thrilled and honored at the same time! This came as a shock as I have never been on a design team before, and I truly hope I can measure up to all the other wonderful and creative designers. The AO stamp line is unique, vintage, and super detailed. I fell in love with them the first time I saw a set and had to have it. I used this set..."Steampunk"...to create this keepsake tag that I will put in my personal scrapbook to remind me of this special milestone. I hope I can inspire all of you, with the projects I make using these gorgeous stamps. 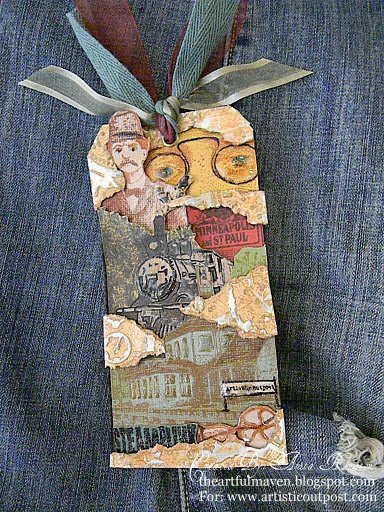 I am also submitting this to the Gingersnap Creations Challenge of "using a line of stamps"
Love the tag! Congrats on being a guest designer. I'll be following your journey. Congrats on the Guest spot at AO - fab steampunk tag! Looking foward to working with you! Super cool that you're asked as a guest designer for AO! I'm not surprised! Your art is stunning! This tag is phenomenal as always! A great milestone indeed! Congrats! Fab, fab, fab tag Anita. I just love the layers you have created and many congrats on your DT position. Thanks for stopping by my blog and leaving a lovely comment, I so appreciate it. Fabulous tag! Thanks for playing the Use a Set Challenge on Gingersnap Creations! Wonderful tag and congratulations on joining Artistic Outpost. Congratulations! What a gorgeous tag. Can't wait to see what else you are designing for AO!